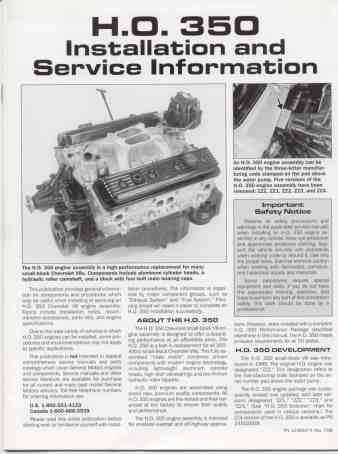 This publication provides general information on components and procedures which may be useful when installing or servicing an H.O. 350 Chevrolet V8 engine. Topics include installation notes, recommended accessories, parts lists, and engine specifications. Page after page of in-depth information on the H.O. 350 ZZZ, ZZ1, ZZ2,ZZ3, and ZZ4 Chevrolet engines.